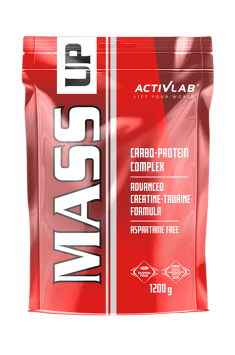 Activlab Mass Up is a product designed for people who want to increase their muscle mass. The gainer supplement contains nearly 90% carbohydrates and 10% protein while maintaining low fat content. The product is available in several delicious flavours, and carefully selected composition helps effectively cover additional calories and help regenerate after training. It’s worth noting that the producer added creatine and amino acid to the store, which supports its transport to the muscles - taurine. Mass Up is designed for people who want to increase the size of their muscles. It’s a highly calorific combination of carbohydrates and protein, which positively affects the process of muscle protein synthesis. It’s recommended for people who want to supplement calories during long-lasting physical activities. It has fast assimilable carbohydrates, providing the necessary energy for working muscles. Maltodextrin, although it’s a complex sugar, provides instant energy. It has a higher glycaemic index than pure sucrose, therefore it’s perfectly suitable for consumption during training. Glucose is in turn a simple sugar that also absorbs very quickly. It’s the basic fuel for muscle tissue; it’s from it that muscular and liver glycogen is formed. Adequate amount of post-workout carbohydrates provides adequate regeneration by supplementing the muscle glycogen exhausted during training. Glycogen is a multi-disposable muscle stored in the muscle, which is a warehouse of quickly available fuel. The high level of muscle glycogen positively affects the results, both in endurance and speed-strength sports. The whey protein concentrate used in the supplement is the most commonly used form of protein by physically active people because it has a very good bioavailability. Every person who trains should know that protein is the basic muscle building material, that's why you should provide your body with the right amount if you want to build muscle mass. Proteins also provide adequate regeneration, eliminating muscle damage and preventing the formation of delayed muscular pain. Creatine monohydrate is the most popular supplement used by athletes to increase strength and muscle mass. Creatine in the body is transformed into another compound, phosphocreatine, which rebuilds ATP (Adenosine-5'-triphosphate), the basic energy carrier in our body. ATP gives its energy to various biochemical processes to generate strength from our muscles, which contain about 95% of the total body of creatine. Creatine supplementation may also increase the amount of anabolic hormone IGF-1 (insulin-like growth factor), supporting the processes of building muscle mass. Taurine, a non-protein amino acid found in large quantities in the brain and muscle tissue. It shows an activity that helps in the transport of creatine to muscle tissue, thus increasing its bioavailability. It also has the ability to increase insulin sensitivity in muscle tissue, at the same time increasing the possibilities of musculature expansion. It also has a positive effect on the level of calcium in the cells, which is necessary to maintain normal muscle contractility. It also has a positive effect on the focus and delays the appearance of fatigue, so we can do more work on the training. In summary, Activlab Mass Up is an excellent product for people who want to increase muscle mass and for people who take long-term physical efforts. It provides immediate energy thanks to quickly digestible sugars, and the addition of protein positively affects the nitrogen balance. The addition of creatine and taurine supports the anabolic capacity of the product. The supplement will effectively support the body during training, as well as ensure proper regeneration after its completion. Dissolve 100 g (4 flat measures) in 200 ml of water or milk. Apply once daily, preferably between the meals or after training. Dissolve 100 g (4 flat measures) in 200 ml of water or milk. Apply once daily, preferably between the meals. Mass Up is designed for people who want to quickly increase their muscle mass. Almost 400 calories per serving will effectively supplement the extra calories. During the construction of muscle mass, the addition of creatine and taurine found in the nutrient is also perfect. I also recommend it as a supplement to be used during training due to the high content of quickly absorbed carbohydrates. Maltodextrin, glucose, whey protein concentrate, glycine, aroma, thickener: carboxymethylcellulose, acidity regulator: citric acid (strawberry, yoghurt and cherry flavor, forest fruits), pigments: cochineal red (strawberry, yoghurt and cherry flavor) , forest fruits) - may have a detrimental effect on activity and attention in children, brilliant blue (forest fruit flavor), ammonia caramel (chocolate flavor, nutty), titanium dioxide (vanilla flavor, coconut vanilla flavor, banana flavor), sweetener: acesulfame K. May contain derivatives of: cereals containing gluten, soy. The supplement stabilizing the hormonal system. It slows down ageing, adds vitality and improves memory.